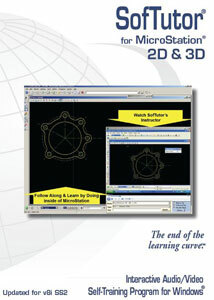 Buy our current SofTutor for MicroStation 2D, 3D or 2D & 3D Video Learning and Technical Support Products. SofTutor Runs Inside of MicroStation! SofTutor for MicroStation 2D (XM & V8i) Table of Contents contains over 6 hours of follow-along video instruction, 109 MicroStation Tutorials with corresponding MicroStation example files. Start where our teacher starts, and he'll walk you through each lesson step by step. You'll learn MicroStation 2D in less than 24 hours. 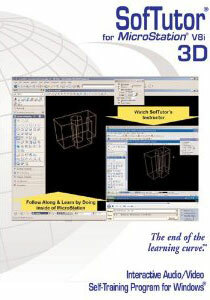 SofTutor for MicroStation 3D (V8i) Table of Contents contains over 4.5 hours of follow along-video instruction, covering 89 MicroStation Tutorials with corresponding MicroStation example files. Start where our teacher starts, and he'll walk you through each lesson step by step. 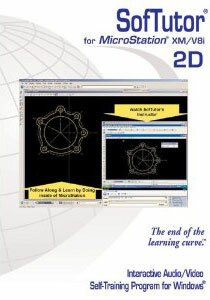 You'll learn MicroStation 3D in less than 24 hours. Same products as above although both are combined into one product.